“We know from experience that people don't stop being homeless until they find self-esteem and dignity,” Dannielle Watson and 14 other recently homeless people wrote in response to a letter published in the New York Times. Shampoo Shuttle is an organization that works to help give the homeless population back their well deserved dignity. We acknowledge that this is not an easy task and that our work alone is not solving the problem; however, we believe that we are part of the process. Shampoo Shuttle is a not-for-profit organization that supplies homeless shelters with shampoo and conditioner by recycling partially used bottles from hotels. We, like many others, have thought about how wasteful it is to throw out the shampoo bottles from hotels after having only used a drop. After some research on the constant demand for shampoo at homeless shelters, we saw an enterprise and Shampoo Shuttle was born. 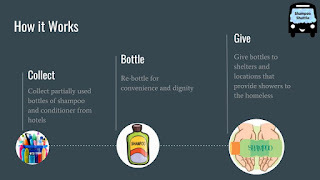 By connecting this excess resource from hotels with a place that is in need, we are able to help both the environment and the homeless population. We have been collecting partially used bottles from the Hampton Inn in Greenfield MA, consolidating them so that all containers are full, and then delivering them to the Salvation Army where they have free showering facilities for the homeless. So far we have made four deliveries of shampoo, conditioner, bath gel, and body lotion, all of which have been received with great thanks. Currently, we are working on creating a mechanism that will help us streamline the bottle filling process so that we can grow our enterprise and help more people.